Summary: In 2006, University of Florida Extension Agents servicing St Lucie and Indian River Counties initiated the Sea Turtle Friendly Practices educational campaign. This campaign involved development of educational displays, publications, and highway billboards. Environmental education centers, public libraries and other outreach organizations assisted with the dissemination of these educational materials and adopted the use of educational displays designed to teach the public “sea turtle friendly” practices. Featured recommended practices included reducing the effects of artificial lighting, removal/relocation of beach furniture at night, protecting/re-establishing sand dunes, etc. This project will reprint color copies of the Turtle Tracks and Turtle Friendly Beaches publications. Table top displays will be made available to environmental education providers in Martin, St. Lucie and Indian River Counties. The project will print and install new highway billboards featuring a “Sea Turtle Friendly Beaches” theme. St. Lucie County owns four highway billboards in the right of ways along the Florida Turnpike and I-95. St. Lucie County will commit at least one billboard to the Sea Turtle Friendly Beaches public education campaign. Results: All final tasks have been completed. 3,500 color copies of the Turtle Tracks and Turtle Friendly Beaches brochures were reprinted. 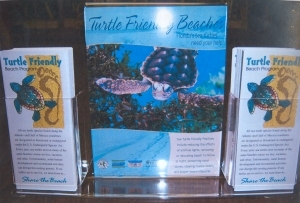 20 table top displays were provided to local environmental education centers and were stocked with Turtle Tracks and Turtle Friendly Beaches publications. Publications were supplied to the following sea turtle coordinators: Rick Herren, Indian River County Sea Turtle Coordinator, and Erik Martin, Ecological Associates. A Sea Turtle Friendly Beaches graphics package was developed and installed on a highway billboard. Installation took place on October 6, 2009 and remained past the one month grant requirement.